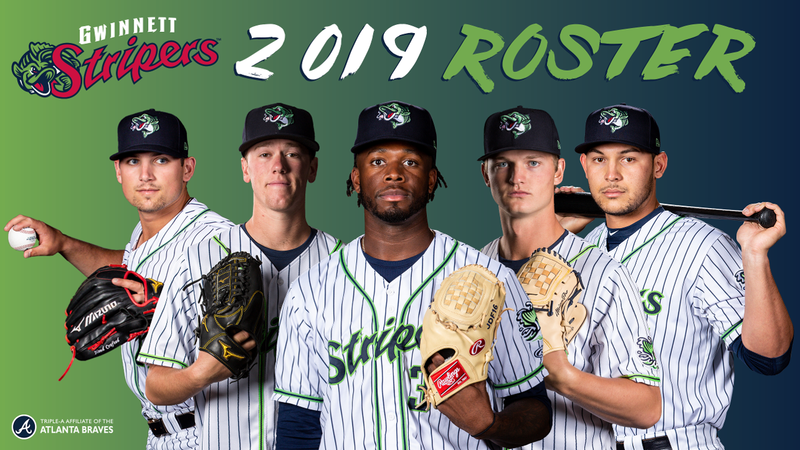 LAWRENCEVILLE, Ga. - The Gwinnett Stripers, in conjunction with the Atlanta Braves, have announced their Opening Night roster for the 2019 season. Third-year manager Damon Berryhill will lead a Gwinnett club that includes three members of the MLB.com Top 100 Prospects list: pitcher Mike Soroka (No. 24), third baseman Austin Riley (No. 37), and pitcher Touki Toussaint (No. 49). The Stripers' active roster features seven players on the Braves' Top 30 Prospects list according to MLB.com: Soroka (No. 1), Riley (No. 5), Toussaint (No. 6), pitcher Kolby Allard (No. 11), pitcher Thomas Burrows (No. 18), pitcher Jacob Webb (No. 26), and catcher Alex Jackson (No. 28). The Stripers are led by Berryhill, pitching coach Mike Maroth (first season), hitting coach Bobby Magallanes (first season), coach Einar Díaz (first season), certified athletic trainer Nick Jensen (second season), and strength and conditioning coach Paul Howey (first season). Soroka, 21, is ranked the Braves' No. 1 prospect and the No. 24 overall prospect in baseball by MLB.com. The right-hander made his Triple-A and Major League debuts in 2018, going 2-1 with a 2.00 ERA in five starts for the Stripers and 2-1 with a 3.51 ERA in five starts for the Braves. Atlanta placed him on the injured list on June 20 due to right shoulder inflammation, and he missed the remainder of the season. Riley, 22, is ranked the Braves' No. 5 prospect and the No. 37 overall prospect in baseball by MLB.com after a banner 2018 campaign. The third baseman batted .294 with 30 doubles, three triples, 19 home runs, 61 runs scored, and 70 RBIs in 108 games between the GCL Braves, Double-A Mississippi, and Gwinnett last year, earning him the Hank Aaron Award for Braves' Minor League Player of the Year. Riley was also named Gwinnett's 2018 Player of the Year after hitting .282 with 17 doubles, 12 home runs, 41 runs scored, and 47 RBIs in 75 games during his Triple-A debut. Toussaint, 22, is ranked the Braves' No. 6 prospect and the No. 49 overall prospect in baseball by MLB.com following a season that saw him rise from Double-A Mississippi to Atlanta's National League Division Series roster. The right-hander earned the Phil Niekro Award for Braves' Minor League Pitcher of the Year after going 9-6 with a 2.38 ERA and an organization-best 163 strikeouts in 24 starts between Mississippi and Gwinnett. A 5-0 record and 1.43 ERA in eight starts with the Stripers propelled him to Atlanta, where he went 2-1 with a 4.03 ERA in seven games during the regular season and 1-0 with a 0.00 ERA in two games during the postseason. Allard, the Braves' No. 11 prospect according to MLB.com, returns to the Gwinnett rotation after making a team-high 19 starts in 2018. The 21-year-old left-hander went 6-4 with the International League's third-lowest ERA of 2.72 during his Triple-A debut with the Stripers, earning him Gwinnett's Pitcher of the Year award. Allard also made his Major League debut with Atlanta last year, going 1-1 with a 12.38 ERA in three games. Webb, the Braves' No. 26 prospect according to MLB.com, returns to the Gwinnett bullpen after going 2-2 with a 3.13 ERA and a team-high 11 saves in 30 relief outings in 2018. The 25-year-old right-hander led the Braves organization in saves with 18 in 51 total appearances between Mississippi and Gwinnett. Soroka, Toussaint, Allard, and Webb are four of eight pitchers on the Opening Night roster that spent time with the Stripers in 2018. That group includes right-handers Connor Johnstone (2-0, 4.50 ERA in five games), Elian Leyva (1-1, 2.70 ERA in 12 games), and Andres Santiago (2-4, 5.60 ERA in 17 games), and left-hander Corbin Clouse (1-0, 2.25 ERA in seven games). Right-hander Dan Winkler, who made 69 appearances with Atlanta last season (4-0, 3.43 ERA, two saves), returns to Gwinnett for the first time since 2017. Burrows, ranked the Braves' No. 18 prospect by MLB.com, is the lone pitcher set to make his Triple-A debut. The 24-year-old left-hander went 6-2 with a 2.66 ERA and 11 saves in 45 outings between Class-A Rome, Advanced-A Florida, and Mississippi last season. Right-hander Rafael De Paula (3-4, 3.41 ERA, three saves in 42 games between Double-A Pensacola and Triple-A Louisville) and left-hander Grant Dayton (missed all of 2018 due to injury) are each slated to make their Gwinnett debuts. Jackson, the Braves' No. 28 prospect according to MLB.com, joins Riley as the top prospects among the Stripers' position players. The 23-year-old catcher batted .201 with eight home runs and 41 RBIs in 99 games between Mississippi and Gwinnett last season. The rest of the offense is largely a veteran unit, led by seventh-year Gwinnett infielder Sean Kazmar Jr. The 34-year-old has been a staple of the Gwinnett lineup since 2013, and leads the club in career games (559), at-bats (1,929), hits (517), doubles (106), runs scored (224), and RBIs (209). Shortstop Luis Marté (.266, two home runs, 21 RBIs in 45 games) also returns from the 2018 club. Eight position players are Stripers for the first time in 2019. Outfielder Adam Duvall batted .195 with 15 home runs and 61 RBIs between the Braves and Cincinnati Reds at the Major League level last year. Catcher Raffy Lopez (.261, nine home runs, 38 RBIs in 50 games with El Paso), infielders Andrés Blanco (.271, nine home runs, 47 RBIs in 96 games with Colorado Springs), Pedro Florimón (.214, three RBIs in three games with Lehigh Valley), and Jack Lopez (.251, eight home runs, 34 RBIs, 14 stolen bases in 113 games with Omaha), and outfielders Ryan LaMarre (.269, seven RBIs in 25 games between Rochester and Charlotte) and Rafael Ortega (.275, two home runs, 28 RBIs, 12 stolen bases in 92 games with New Orleans) all saw time at the Triple-A level with other organizations in 2018. Winder-Barrow High School product Travis Demeritte (.222, 17 home runs, 63 RBIs in 128 games with Mississippi) rounds out the outfield and is poised to make his Triple-A debut. Gwinnett's Opening Night roster includes nine players who saw time with a Major League team in 2018: Allard, Duvall, Soroka, Toussaint, and Winkler with Atlanta, and Raffy Lopez (.176, three home runs, 13 RBIs in 37 games with San Diego), Florimón (.225, two home runs, five RBIs in 50 games with Philadelphia), LaMarre (.279, two home runs, 18 RBIs in 76 games between Minnesota and the Chicago White Sox), and Ortega (.233, seven RBIs in 41 games with Miami) with other teams. The roster also includes eight members of the Atlanta Braves' 40-man roster: Allard, Dayton, Duvall, Jackson, Soroka, Toussaint, Webb, and Winkler. The Stripers open the season at Coolray Field on Thursday, April 4 with a 7:05 p.m. game vs. the Norfolk Tides. Opening Night tickets are on sale now at GoStripers.com/tickets. Tony Schiavone has the play-by-play call on 97.7 and 93.5 FM The Other Side of the River beginning at 6:50 p.m.